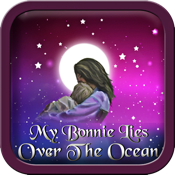 Having trouble remembering the words to My Bonnie Lies Over The Ocean? Not to worry. This lullaby player includes the lyrics so you can sing along. Young children love repetition. How often do we hear “Play it again! Play it again!” So this player features a repeat function that plays this lullaby up to 12 times in a row. And, if that’s not enough, there’s also has a loop feature that plays the song over and over until you press stop. The controls are so easy to use that a 2 year old will quickly learn to use this app themselves and it will help them learn to count, too. The music is gorgeous. Listen for yourself by clicking on the YouTube video below. It is performed by leading lullaby singer and healing music artist, Amy Robbins-Wilson. She holds a masters degree in song performance from the University of Limerick in Ireland and her clear and crystalline voice has been called “angelic” and “like a whisper to the soul”. She’s a Mom’s Choice Awards gold medalist and this recording has been recognized with a Kid’s Music Award. The MP3 alone sells on iTunes for 99 cents so this app is like getting a baby friendly music player for free! And if your little one melts down in public or at home, this app works wonders as a tantrum tamer by refocusing your child with some truly beautiful and calming music. Buy now and start enjoying this glorious music with your child today.